Basic explanation of how to use Bowlanes to your advantage! I just want to show you guys a somewhat more advanced way to sound louder and/or softer while playing without having to press down super hard. First off I apologize for the bad quality. 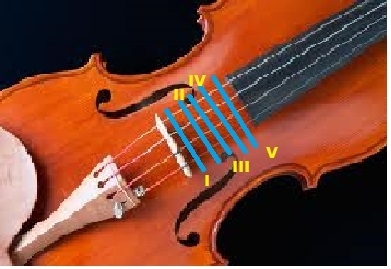 On the picture you see 5 Blue lines marked 1-5 in roman numerals. These are the bow lanes. Albeit the picture is not perfect in showing where they are, but they get the point across. As you move from Lane 1 to Lane 5 your loudness starts to increase. This is because the closer you get to the bridge, the less the string is actually vibrating. You can see this if you bow behind the bridge or on the scroll of the instrument. So, let's say I am playing a piece that requires me to play Fortissimo(FF) the entire time up until a section where I play Fortississimo(FFF), well I am already playing extremely loud, so how do I get louder? Well, if you play the FF section of the song in bow lane 1, then when you play FFF you switch to lane 5, then your sound will increase without any added effort! This method is often mentioned early in lessons as something to avoid, but as you get more and more skilled with your bowing, you can start to employ this method, making a much sweeter sound when playing loud notes, rather than just bearing down extremely hard.